My Expert Alkaline Water Sticks Review: Scam or Legit? Alkaline Water Sticks Review: Scam or Legit? Now that most of the world is aware of alkaline water benefits, there are all types of products popping up that claim to turn regular drinking water into alkaline ionized water. One of these new products is the alkaline water stick. In today’s article, I’ll share with you my expert alkaline water sticks review. Are they the real deal or a waste of money? One important note I must add before we dive into the review is that alkaline water alone is not what gives us all the juicy health benefits of drinking alkaline water. The key to alkaline water is that it’s ionized by alkaline water machines or water ionizers. The ionization process is what turns normal, slightly-acidic drinking water into an antioxidant, anti-aging powerhouse. With that quick note out of the way, let’s test the trustworthiness of alkaline water sticks. What is an alkaline water stick? An alkaline water stick is a metal stick with mesh openings that houses minerals including tourmaline, water-soluble calcium carbonate, coral fossil, and black stone. To make your drinking water alkaline, you insert the stick into your water bottle, shake vigorously, then allow the stick to stay submerged several minutes before removing it from the bottle. The alkaline minerals inside the stick raise the pH of your water to a more alkaline pH. This part I believe to be true. However, the product page goes the extra mile, claiming that these sticks “micro-cluster” water molecules, increase the negative ORP to boost antioxidant levels and oxygenate the water. I have trouble believing that all that magic happens in the absence of a premium water ionizer. If that were the case, there would be lab test results showing that these water sticks can do the job of an alkaline water machine. Do I think they safely raise the pH of your water? Yes, to a degree. Although, you don’t want to overdo your mineral intake either. An alkaline water machine doesn’t add minerals to your source water. The ionization process strips away acidic minerals while creating antioxidant-rich water. True ionization requires electricity. They are great for travel when you can’t bring your water ionizer with you. The minerals can reduce the chlorine odor found in tap water. Each stick can alkalize roughly 800 liters of water. Customer pH tests prove the sticks do raise water pH. They are quite affordable compared to a water ionizer. Several users reported they didn’t like the taste. Below, are the four most popular brands of alkaline water sticks with the most positive reviews. The EHM alkaline hydrogen portable water ionizer stick is currently the most popular and appears to be the best stick currently available. The EHM alkaline water stick claims to boost molecular hydrogen, which is a feature available only in the most premium alkaline water machines I’ve researched including Life Ionizers, Tyent and Kangen Water. One person prefers using the stick over alkaline water drops or powders. Another stick owner is happy to be saving money on bottled water by using the stick instead. Bottled alkaline water can get pricey, however, natural alkaline water does come at a price. One man has been giving his diabetic cat alkaline water using this stick and has noticed improvements in the cat’s health. It “still works great” after several months of use. One woman reported a pH of 8.8 after using the stick. Another woman uses it while she travels to supplement her Kangen at home, and she gave the stick a 5-star review. A verified owner said the water tastes “awful,” and the pH strips didn’t show a boost in pH level. One woman reported no benefit in enhancing the taste of her water. A couple of users left the stick submerged in water for 8+ hours and found no difference in pH using pH strips (which aren’t as accurate as digital pH meters). After reading through the reviews, I’ve concluded the taste is certainly not for everyone. As for raising the pH, I think it depends on your source water and how acidic the water is to begin with. It seems that most people reported a boost in pH while a handful of users reported no difference in pH using test strips to test. I’d like to see a digital pH reading before and after to confirm whether the pH shifted. Overall, I think these alkaline water sticks are decent to use for short-term travel, but there are much better options for long-term use. If you’re looking for a budget alternative to an alkaline water machine, a better option than the water stick is a quality alkaline water filter pitcher. Click here to check out my review for one I highly recommend, or click here to go straight to the Amazon product page. If you currently have a reverse osmosis water filtration system in your home, there are remineralization cartridges available to boost the pH of your RO water since the reverse osmosis process can make your water slightly acidic. You can also check my top 10 list for best and highest pH bottled water brands currently available. 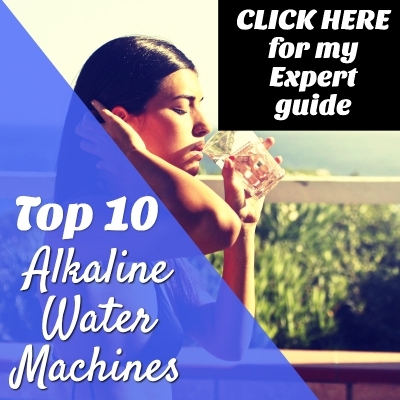 And last but not least, my list for the best alkaline water machine in 2018 is very helpful for choosing the best water ionizer and learning everything there is to know about alkaline ionized water. There are also several ways to make homemade alkaline water with lemon, apple cider vinegar or coconut. Stay tuned for my upcoming articles that explain the process for each of the three ingredients! In my opinion, alkaline water sticks are good to have in a pinch or for short-term travel, but as I mentioned earlier, they’re not great long-term alkaline water solutions. Instead, choose a quality alkaline water pitcher or do more research on a water ionizer to see if one is right for you. You can also test if alkaline ionized water is right for you by ordering a few cases online from trusted brands such as Essentia.